We’re halfway through the 3rd week of class and by now I’m sure you have had hundreds of emails from all the clubs and societies that you signed up to during freshers’ week, a bunch of messages from your lecturers telling you about deadlines and room changes, plus the weekly ‘are you okay?’ WhatsApp from your parents. It can be pretty overwhelming in the first few weeks, whether you’re a 1st year or PhD student. It’s hard to know how to find your feet and how to work out the balance between social life, academic time and sleep. So let me help you out. Anything is good for this, it’s whatever works for you that is important. Personally I prefer physically writing things down so I always buy myself a new planner each academic year. This year I went for the Dodo Acad-pad 2018/19. 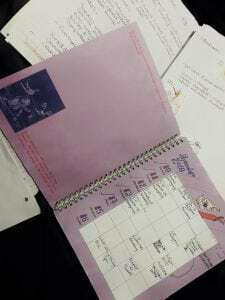 For me this was great as I had room each week to write the many things I do on the days, but also each week comes with room to write down anything that doesn’t fit, for example things I need to do, my shopping list etc. Also you get a little doodle or story each week. If you prefer something electronic that is easy to have with you always, there are loads of wonderful apps you can download. iPhones built in calendar is really good if you have multiple apple devices as then your calendar can sync up on them all. Google calendar is fantastic if you like to be really organised as you can even colour code all your different commitments so you always know what’s happening at just a glance. Despite writing down your email address for 20 different societies, it is more than likely you will not have time for them all. By now you should have been able to go along to most society welcome meetings and all the sports give-it-a-go sessions and this should make it easier to decide which activities to spend your time on and which you enjoyed more than others. Plus, there’s the all important lectures you need to have time for. Firstly write down your classes. They are the compulsory part of uni and what we are all here for, despite how sad it seems to have to get up for a 9am when it’s your only class of the day after a night out at skint. Once they’re down in the organiser you can see how much time you have to work with. If you are on the committee for any sport club or society, it is more than likely you will have some meetings that are mandatory, so secondly get those down in the organiser because if you’ve committed to doing them you need to have the time for them. After that it’s about deciding which clubs you want to take part in that work around the priorities. If you can do lots and still have time to study then go for it! However make sure you are being realistic with how much time you are leaving yourself to study. If needs be even pencil in some study slots so you commit to doing them. Once it’s down in the organiser it’s final! University is very important. Some of you may think getting high grades is important. Some people might be here more for the experience and to get a degree, not necessarily a good degree that’ll lead to a good career. No matter the reasons for being at uni, please remember that it isn’t the be-all-and-end-all. Nothing is more important than your health, whether it be physical, mental or emotional. As a good friend once pointed out, “you can’t get a 1st if you’re dead.” Make sure you schedule in time to relax, time to see your friends, some you-time. And remember to have fun. For a lot of us, university is a one time thing, so enjoy it whilst you can. 3rd year forensic anthropology student who enjoys reading good words and attempts to type some too. I am passionate about our planet and saving it, tea, my friends and family and food. Hoping to help you to navigate university life anyway I can.